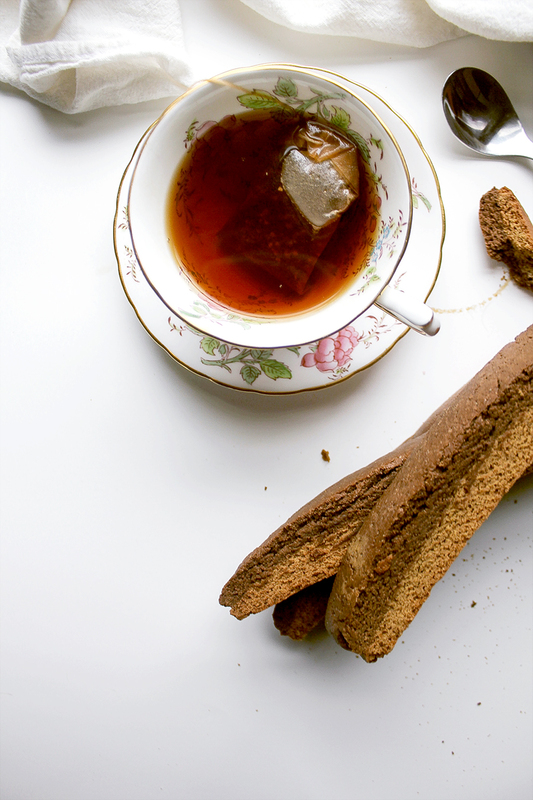 These chocolate and chai biscotti are perfect with your afternoon cup of coffee or for lazy mornings in bed with a pot of tea for breakfast. MERRY CHRISTMAS [EVE] (or, to all of you who don’t celebrate Christmas, HAPPY TUESDAY!). I love Christmas eve just as much as I love Christmas day. This is because, growing up, my parent’s were divorced so we always had Christmas with my Father ‘s family on the 24th and then had ANOTHER Christmas with my mother’s family on the 25th. I never could relate to those kids who were so excited to get to open ONE present on Christmas Eve to hold them over – I always received DOZENS of gifts on Christmas eve followed up lots more gifts on Christmas day. As I’ve aged, I’ve toned down a little (just a little!) on my excitement for a double dose of gifts but have learned to find joy in so many other wonderful aspects of having two Christmases in a row. Double the santa cookies. Double the Christmas movies. Double the Yule log playing in the background on your tv (speaking of that, I’ll be playing Lil Bub’s yule log video this year – if my family doesn’t think thats too weird). But, to be completely honest, this biscotti has nothing to do with Christmas and I really just chatted about Christmas Eve because I’m just so darn excited its finally here. 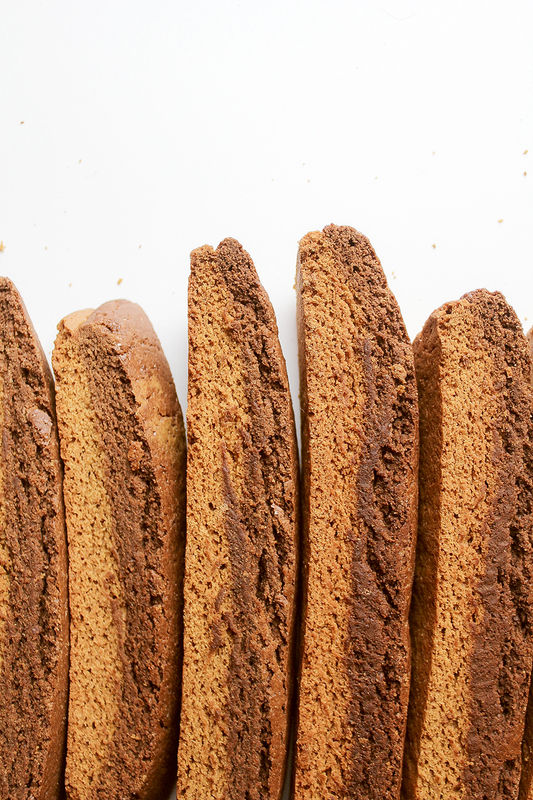 This biscotti is actually about having 11 days off of work in a row – which is the longest vacation time I’ve had in 2013. 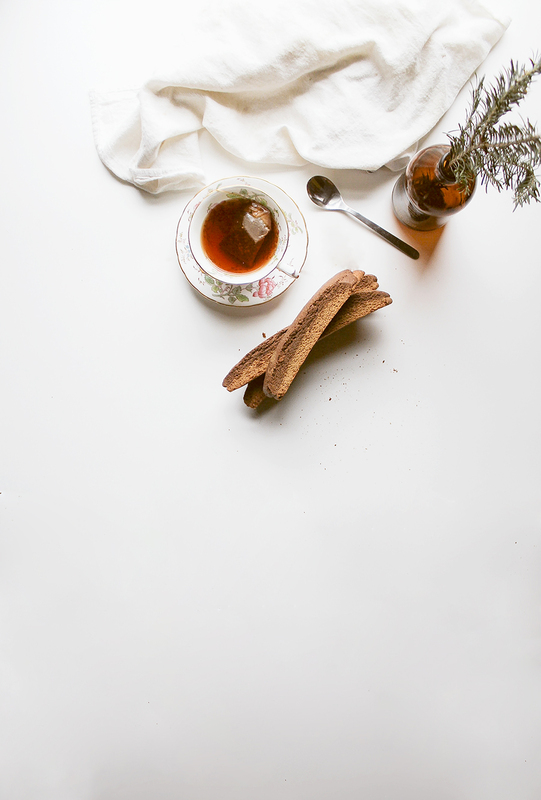 It’s about finally having lazy mornings after lazy mornings of sipping coffee in bed and enjoying a favorite magazine while munching some biscotti. It’s all about mastering the technique of getting the biscotti soggy enough in your coffee that it doesn’t crumble all over your sheets but firm enough that it’s still crunchy when you take that first bite. But don’t worry, it’s okay if it takes you a few days to master this technique – we’ve still got loads more days off ahead of us! Place butter, sugar, salt, baking powder, and vanilla in a large mixing bowl and beat until creamy. Next, beat in the eggs, one at a time, until well incorporated. Then slowly add the flour until everything is mixed evenly. Divide the dough in half and remove half of it from the mixing bowl. Beat the ginger, cinnamon, cardamon, pepper, cloves, and nutmeg into the dough until well incorporated. Remove the spiced dough from the mixer and divide in half again. Make two oval shaped doughs (one on each baking sheet) that are about 12" by 3" each. Stick in the freezer while you prepare the other half. Return the remaining dough to the mixer and beat in the cocoa powder. Once incorporated, divide the cocoa dough in half and shape on top of each of the chai spiced loaves - shaping the chai dough so it lays directly on top of the cocoa dough in a oval shape. Bake for 25 minutes. Remove from heat and let cool for 20 minutes. Lower oven heat to 325 degrees and cut the dough into 3/4" slices. Turn the slices to their sides (so you can see the line between the two flavors) and return back to the oven for 30-40 minutes or until they begin to dry and brown. Enjoy in bed for the next week straight. Growing up and to this day we have always had 2 Christmas’ – one with at my Grams (my Dads Mom) on Christmas Eve and 3 stops on Christmas day; needless to say there was never a shortage on gifts! To this day we still celebrate with my Dad and Gram on Christmas eve and with my Mom Christmas Morning; Justin had the same tradition like many of opening a gift on Christmas eve but we always had a full on Christmas that day! Your biscotti sounds amazing; luckily I don’t have to be back to work until the third of January and look forward to getting back to the kitchen for some coking and baking! Yum! I’ve never made biscotti before but I love chocolate and I love chai so these are going to be my first attempt! I was just mid-baking these and realised you talked about eggs, but I didn’t see eggs in the ingredients list. How many? Yikes! Well that is a pretty important part of the recipe! I’ve updated the recipe above – thanks for catching! Hope the recipe turned out wonderful for you anyways! I figured it out from some other recipes and they turned out awesome! I just noticed this: “Once incorporated, divide the cocoa dough in half and shape on top of each of the chai spiced loaves – shaping the chai dough so it lays directly on top of the cocoa dough in a oval shape.” It might not matter, but which is on top of which? From your pictures it’s the chocolate, but I just wondered if it mattered.